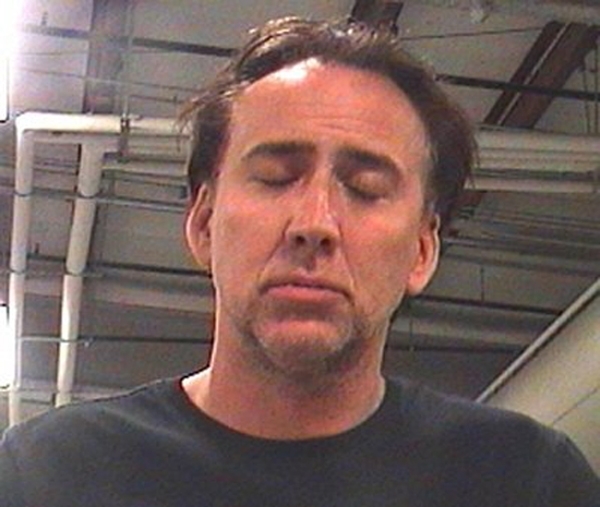 Nicolas Cage was arrested by New Orleans cops in April 2011 on domestic abuse and disturbing the peace charges. The Academy Award winning actor, 47, was collared after he allegedly got into a confrontation with his wife. Cage was briefly jailed before posting bond to secure his release from the lockup of the Orleans Parish Sheriff's Office (where he posed for the above booking photo). Submitted by smokey888x2 on Fri, 2011-04-22 17:31. "hey man, I'm not acting, I feel like dhuuuu"
Submitted by Burp on Fri, 2011-04-22 16:52. So he was beating up his little japanese wife? I guess she wasn't as submissive as he thought she was. Submitted by MikeNC on Tue, 2011-04-19 22:54. Submitted by kandij653 on Mon, 2011-04-18 16:06. Submitted by Darth Tater on Mon, 2011-04-18 03:18. He looks like he is stoned out of his mind right now, know what I mean??? Submitted by BLONDECHICK_FTW on Tue, 2011-04-19 14:08.
yea probably. he's probably all like TURN OFF THE DAMN LIGHTS!!! Submitted by Owossoan on Sun, 2011-04-17 06:27. Nice backdrop, just like in the movies! Who's in charge of scenery? Mebbe this is a scene from The Rock Pt ll. The important question is: What did the toxicology report say? Was Nicky buzzed at the time? Probably! Submitted by Lefty on Sat, 2011-04-16 23:36. Submitted by Ididntdoit on Fri, 2011-05-06 11:11. Submitted by nIT2winIT on Wed, 2011-04-27 00:31.
who knew changing his last name all those years ago would be of great significance today?